Teacher’s Comments: Unique and challenging. Pure golf. 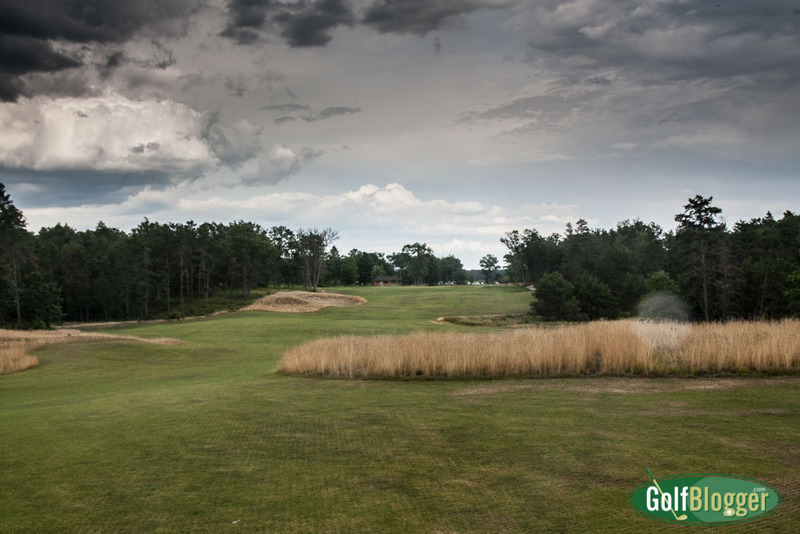 The Loop At Forest Dunes is comprised of two courses: The Red and The Black. Visually, the two are very much the same. Each is cut through acres of sandy, relatively flat Northern Michigan pine barrens. The edges of the wide fairways are thick with low native ground cover. Abundant bunkers have a natural, almost wild look. Indeed, both The Loop Red and Black look as though architect Tom Doak walked out into the northern Michigan wilderness with a few stakes to see what holes he could find. The Loop Red and Loop Black play similarly, too. The ground is designed to be hard and fast, like a links course. 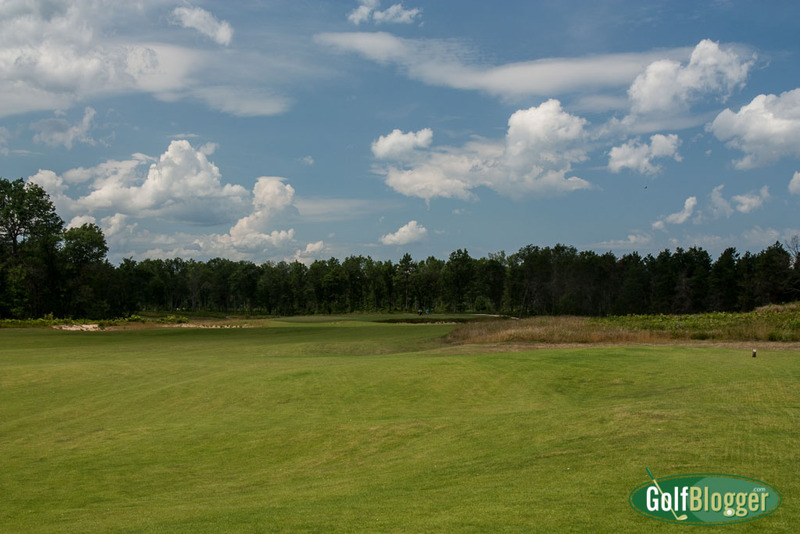 The generous fairways are undulating, with mounding throughout that will cause a ball to skip in unexpected directions. 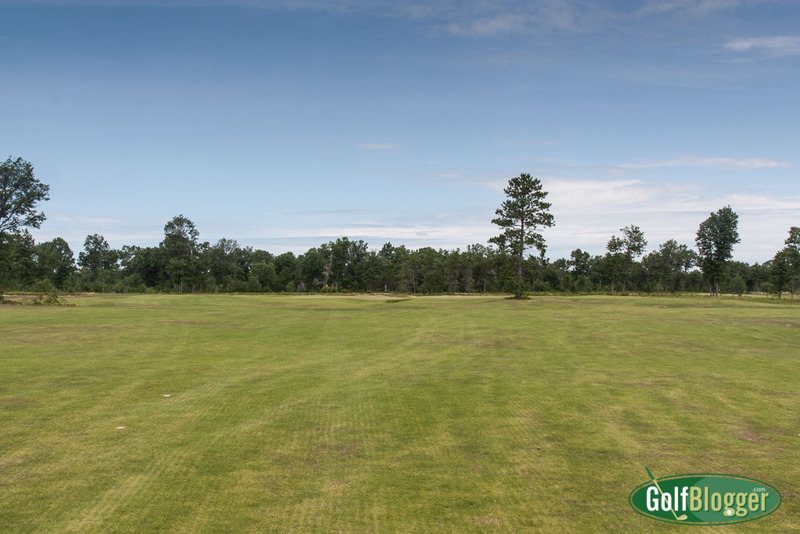 It is hard to miss a fairway, but angles to the green are very important. Around the greens, both courses demand imagination. The eighth at The Loop Black is a 120 yard par 3. But while the look and feel of the Loop Red and Black are similar, the two clearly are different courses. The Red starts out a bit more slowly, starting with the 11, 9, 7 and 13 handicap holes. The middle of the round — holes eight through ten — is tough, with the 1, 5 and 2 handicap holes, respectively. Relative breathers are offered on holes six and seven. The Black, on the other hand, challenges from the start with the 5, 15, 1 and 9 handicap holes. 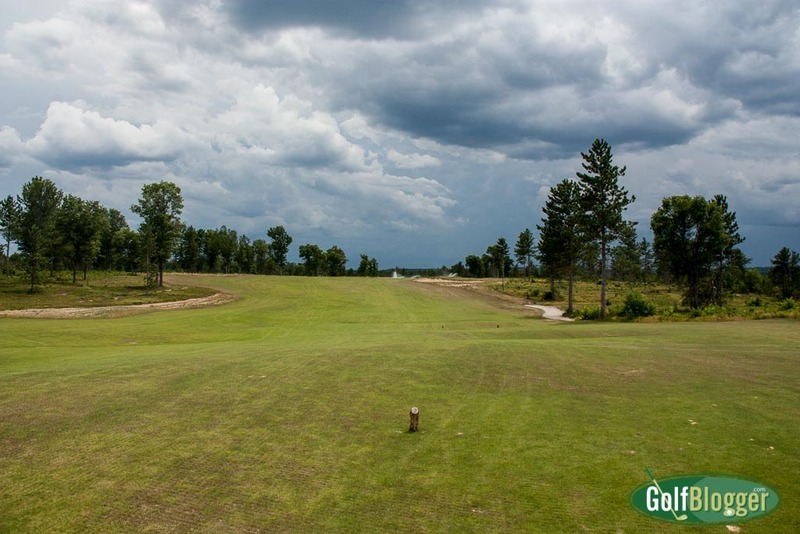 The center stretch of holes – nine through eleven — also is very tough, with the 3, 4 and 8 handicap holes. The Loop Black ends easier, however, finishing with the 18 and 10 handicap holes. I will probably be told that I am wrong, but my sense is that the Red holes tend to play slightly uphill, while the Black has a slight downhill tendency. The catch, of course, is that the Loop Red and Loop Black are the same course, played in opposite directions. More precisely, the Loop Red and Loop Black are two courses that share the same eighteen greens and fairways. The diagram above shows the routing for The Loop courses. Starting at the top right of the diagram, tiny colored arrows indicate the position of the teeing grounds. To see how each course plays out, follow from the arrows to the next green. The teeing grounds for the next hole are near the green, and then follow from there. If you’re following on the diagram — or if you are playing — my advice is not to try to figure out how the holes correspond when the course is playing in the other direction. I did while playing, and quickly got mentally lost. The best way to think of The Loop is as two distinct courses. The concept of The Loop works for a couple of reasons. The first is that the course plays in only one direction on any given day. As with every other golf course, the Loop is played from hole one, to two, and so on. After finishing on the first green players walk a dozen yards or so to play from the next teeing ground. There are no double greens at The Loop. Because the course is played only in one direction, there are eighteen greens to go with the eighteen holes. The fifth at The Loop Red Course is a 467 yard par 4. The wood post marks a teeing area. The second reason that the concept works is that there are no “tee boxes,” per se. Rather, there are teeing grounds — flattish looking stretches of fairway where the markers are set. The teeing grounds when The Loop plays in clockwise become part of the fairway when The Loop plays counter-clockwise. The areas look completely natural, so other than the divots players will inevitably leave, there should be no indication of the previous day’s tees. The idea of large teeing grounds also affords The Loop a huge variety of options when setting up on any particular day. Tee boxes could be in one spot on Tuesday, but positioned a dozen yards away when The Loop next plays in that direction on Thursday. There is a possibility on several holes of radically changing the play by re-positioning the markers. A third reason that The Loop works is the natural effect of approaching terrain features from different directions. A fairway that turns slightly left when played in one direction bends to the right when played in the opposite. Trouble that threatens the last third of a hole when played clockwise becomes an mere inconvenience to be carried off the tee when playing counter-clockwise. An uphill shot when playing when playing one day becomes a downhill shot the next. Each of the eighteen greens are of medium size, and sculpted in such a way as to present different challenges from different directions. For example, there is a biarritz green on Loop Red hole seven that presents the humps on the front and rear of the green. Approaching the same green when it plays as Loop Black hole eleven, players will find the humps left and right. A rectangular green presented from one direction will be narrow and deep, while playing wide and shallow when The Loop plays in the opposite. Finally, Tom Doak did a tremendous job of incorporating features that change the look of the holes when played in different directions. These reveal themselves most prominently in the facing and positioning of bunkers. Bunkers that cannot be seen in one direction become a threat when played in the other. The menacing face of a bunker at the bend on the 12th hole on the Loop Black is an innocuous and all-but-out-of-play grassy mound on the Loop Red 7th. My favorite hole — on either course — is the Loop Black’s par four twelfth. The hole measures 381 from the back tees, and 321 from the middle. Bunkers left and right some two hundred yards out force a decision: Try to sail the bunkers, threat a shot between them, or lay up short. From the bunkers, the fairway tilts right and downward to a green surrounded by bunkers. The same fairway serves as the seventh for the Loop Red (counter-clockwise). On the Red Side, I loved the finishing par 4 eighteenth. Stretching to 475 from the back, and 406 from the middle tees, it asks for a shot down into a valley, and then a largely blind shot back up to the green. 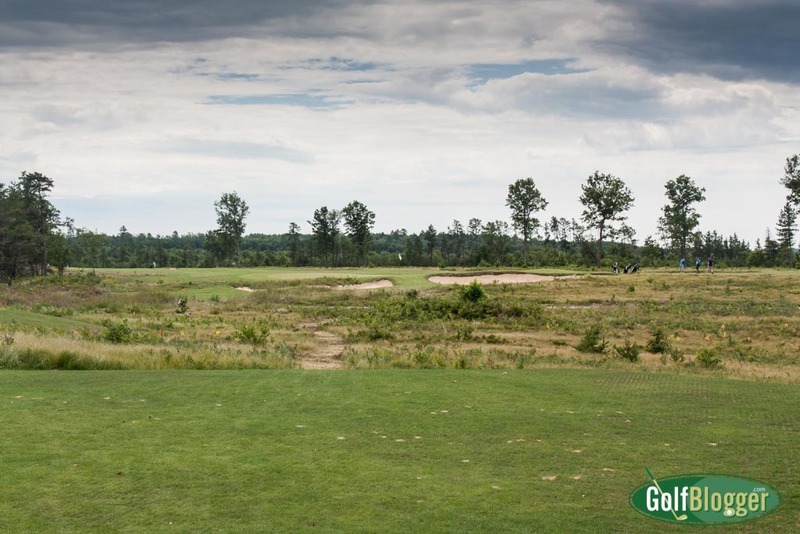 The Loop is laid out on some 200 acres — about half of what Forest Dunes consumes. However, 95 of those acres are fairways, compared to Forest Dunes’ thirty. Still, maintenance costs should be far less than that required for two separate courses. It is entirely unfair to comment on course conditions on the day I played. The Loop was in the process of a “soft” opening, with the fairways still growing in. The greens, however, were already in great shape. 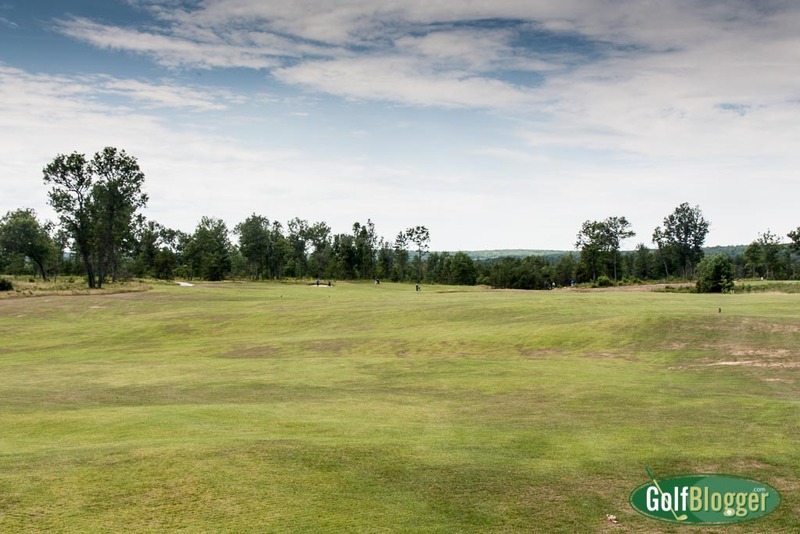 The Loop is a pure golf experience, and as such is walking-only. I pushed my cart, and thought that it was a very easy walk. While they may run into ADA difficulties at some point, I think that only the most unhealthy would be unable to make this round. I played my second round there with a gentleman in his mid 70s, and he had no problem at all. The Loop has a developing caddy program, which at this point can provide one with a reservation. I expect that — like Erin Hills in Wisconsin — players will usually opt for a caddy. At Erin Hills, players can either carry their bags, or pay for a caddy. If a player must ride for medical reasons, they pay for a caddy who does the driving. To play The Loop, you’ll need to stay on site. I stayed in a great house that had more than enough room for a foursome, and probably was ample for eight. 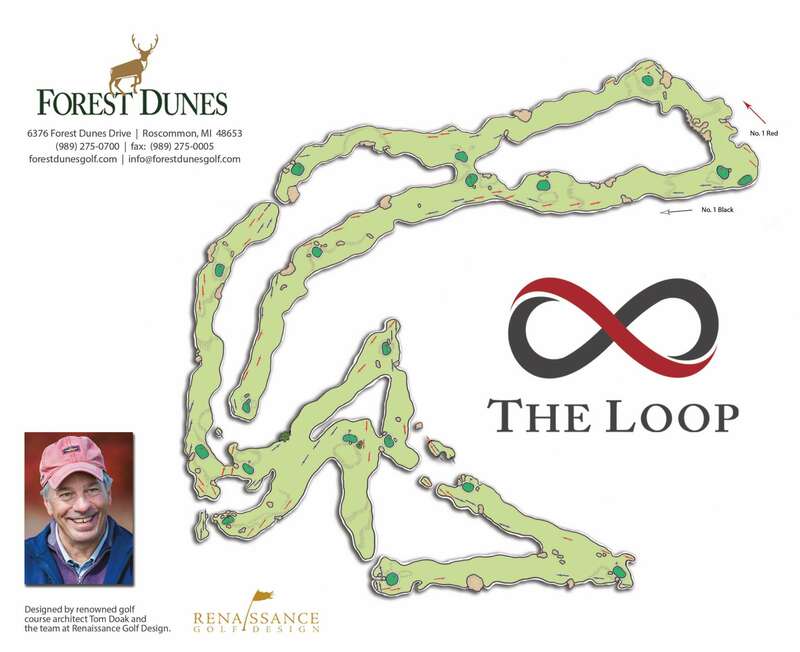 I think an ideal plan would be to stay for two nights: play Forest Dunes; play The Loop Red; then play The Loop Black. The on site restaurant has some terrific food, but if you’re staying in one of the available homes, you’ll be able to cook. Going forward, owner Lew Thompson plans on adding additional rooms and restaurants. For a photo tour of The Loop Red, click here. For a photo tour of The Loop Black, click here.